I skipped gym to go to Manila Cathedral’s crypt tonight, hoping that, since Jaime Cardinal Sin was buried there yesterday, the crypt would still be open for people who want to pay their last respect, like what the Vatican did to St. Peter’s grottoes days after the Pontiff was buried. I don’t give a damn about the late prelate or what he stood for. I just want to seize the opportunity to get inside the crypt and take pictures. I have this thing for old churches. But what I saw along the way was something far more interesting. While walking along General Luna Street, I heard what seemed to be the strains of an orchestra blaring from loudspeakers. It was coming from one of the two humongous, air-conditioned tents called Clamshells erected a block away from the exquisite San Agustin Church. Outside the tent was a small crowd dressed in red shirts with the word FIRM (Friends of Imelda Romualdez Marcos) in bold letters. They were carrying placards that said “We love you Madame Imelda” and “Mother, We Need You!” Curious, I crossed the street to investigate. 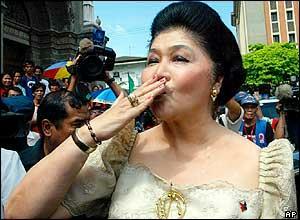 At the entrance of the Clamshell was a big picture of Imelda Marcos in her youth. It was, apparently, her birthday. She does have a reason to celebrate. Not everyone gets to be half as old as God. Whoever originated that local proverb about evil weeds having long lives should receive a Nobel Prize. I peered through the glass entrance of the tent. Cramped onstage was a chamber orchestra playing a dramatic arrangement of the love song Ikaw (You). The hall was packed with round dinner tables and hundreds of Marcos loyalists craning their necks to get a better view of the performers. Just below the stage, lit by a spotlight was Madame herself in all her frivolous glory, standing beside a violinist who was playing the solo parts of the song. She was resplendent in a heavily embroidered, sequined avocado green stylized national dress. I couldn’t believe it. Was I actually seeing the Steel Butterfly herself? Let me check, trademark 60’s coiffed hair; unique facial contortion that is a cross between theatrical sorrow and regal condescension, yup that’s her all right. Man, was she radiant! But then again, if your Swiss bank accounts were as fat as hers, it would be almost sacrilegious not to look radiant and true and good and beautiful. I left the party and continued walking toward the cathedral. When I found out that it was already closed, I hurried back to Imelda’s birthday bash to peer through the glass walls again. The scene was just too delectable to be ignored. This time, a group of middle-aged female followers whose get-up seemed to have been frozen in the 80s was singing Madame’s favorite song, Dahil Sa ‘Yo (Because of You) to the twangs of an untamed electric guitar. I had goosebumps. I shuddered in delight. I simply love this country. Just last Monday, the President did a Clinton as she admitted on national TV that she was the voice in the controversial tapes, practically implying that she rigged the presidential elections last year. The same people that overthrew her predecessor and catapulted her into power are now amassing against her. The peso has sunk to abysmal depths against the dollar. Oil prices are up. Senators are morons. Corruption is an art form. And before me was the ousted dictator’s widow shedding tears of joy on cue. Beautiful. Magic realism can’t get any better than this. No, this is beyond magic realism. It’s a class on its own. I could almost imagine Gabriel Garcia Marquez concocting another epic—One Hundred Years of Surrealism. Beautiful. Just beautiful. You have a very interesting scope of subjects here! I dropped in from Transience's blog, and really enjoyed the interview posted below. Thoughtful answers. I really liked the poem in french...sometimes grammar and spelling are not so important. The words, especially the last two lines, were quite moving. philippines, my philippines. never ceases to amaze me, too, but i love it dearly! thanks. you're right to hells wiht grammared and spelign. what's importtant is to get the mesage acorss. so you're back from the dead! i love my philippines, too. it never fails to give me just enough entertainment and amusement everyday to get on with my life. imelda is pretty. she is misunderstood suffering from child like delusions that inadvertantly brought her family, the nation, everything down. i would love the philippines to grow up. Insanity keeps this country sane despite itself. she gets away with it like most congressmen, i mean, criminals in this country. we have a long way to go before we could grow up. oooohhhhhh, i love this post. such a miscellany of sweet-bitter treats that makes it exciting to pop a pill and see how deep the rabbit-hole goes. and you do know that i'm currently without country, so i shall have to get back to you on the issue. you'll wait for me, yeah? i am still in transit. and i can't comment on the amazing interview you did. i. cannot. comment. i'm all gushy-gushy and i want to do it right below the goddamn appropriate post. help me, please.